The central nervous system directs the functions of all tissues of the body. The peripheral nervous system receives thousands of sensory inputs and transmits them to the brain via the spinal cord. The brain processes this incoming information and discards 99% as unimportant. After sensory information has been evaluated, selected areas of the central nervous system initiate nerve impulses to organs or tissue to make an appropriate response. Chemical influences are capable of producing a myriad of effects on the activity and function of the central nervous system. Since our knowledge of different regions of brain function and the neurotransmitters in the brain is limited, the explanations for the mechanisms of drug action may be vague. The known neurotransmitters are: acetylcholine which is involved with memory and learning; norepinephrine which is involved with mania-depression and emotions; and serotonin which is involved with biological rhythms, sleep, emotion, and pain. Stimulants are drugs that exert their action through excitation of the central nervous system. Psychic stimulants include caffeine, cocaine, and various amphetamines. These drugs are used to enhance mental alertness and reduce drowsiness and fatigue. However, increasing the dosage of caffeine above 200 mg (about 2 cups of coffee) does not increase mental performance but may increase nervousness, irritability, tremors, and headache. Heavy coffee drinkers become psychically dependent upon caffeine. If caffeine is withheld, a person may experience mild withdrawal symptoms characterized by irritability, nervousness, and headache. Caffeine and the chemically related xanthines, theophylline and theobromine, decrease in the order given in their stimulatory action. They may be included in some over-the-counter drugs. The action of caffeine is to block adenosine receptors as an antagonist. As caffeine has a similar structure to the adenosine group. This means that caffeine will fit adenosine receptors as well as adenosine itself. It inhibits the release of neurotransmitters from presynaptic sites but works in concert with norepinephrine or angiotensin to augment their actions. Antagonism of adenosine receptors by caffeine would appear to promote neurotransmitter release, thus explaining the stimulatory effects of caffeine. The stimulation caused by amphetamines is caused by excessive release of norepinephrine from storage sites in the peripheral nervous system. It is not known whether the same action occurs in the central nervous system. Two other theories for their action are that they are degraded slower than norepinephrine or that they could act on serotonin receptor sites. Therapeutic doses of amphetamine elevate mood, reduce feelings of fatigue and hunger, facilitate powers of concentration, and increase the desire and capacity to carry out work. They induce exhilarating feelings of power, strength, energy, self-assertion, focus and enhanced motivation. The need to sleep or eat is diminished. Levoamphetamine (Benzedrine), dextroamphetamine (Dexedrine), and methamphetamine (Methedrine) are collectively referred to as amphetamines. Benzedrine is a mixture of both the dextro and levoamphetamine isomers. The dextro isomer is several times more potent than the levo isomer. The misuse and abuse of amphetamines is a significant problem which may include the house wife taking diet pills, athletes desiring an improved performance, the truck driver driving non-stop coast to-coast, or a student cramming all night for an exam. and methamphetamine (Methedrine) are collectively referred to as amphetamines. Amphetamines and electroconvulsive therapy act by this mechanism. Amphetamines mimic norepinephrine. Monoamine oxidase (MAO) inhibitors are thought to act as antidepressant agents in part by preventing the breakdown and inactivation of norepinephrine. the action of norepinephrine at the receptor site is terminated by the re uptake of norepinephrine by the neuron from which it was originally released. The tricyclic antidepressants are the most effective drugs presently available for the treatment of depression. These act by increasing the release of norepinephrine. Amphetamine and cocaine can also act in this manner. Imipramine, amitriptylin, and other closely related drugs are among the drugs currently most widely used for the treatment of major depression. The activity of the tricyclic drugs depends on the central ring of seven or eight atoms which confers an angled or twisted conformation. The side chain must have at least 2 carbons although 3 appear to be better. The amine group may be either tertiary or secondary. All tricyclic antidepressants block the re-uptake of norepinephrine at nerve terminals. However, the potency and selectivity for the inhibition of the uptake of norepinephrine, serotonin, and dopamine vary greatly among the agents. The tertiary amine tricyclics seem to inhibit the serotonin uptake pump, whereas the secondary amine ones seem better in switching off the NE pump. For instance, imipramine is a potent and selective blocker of serotonin transport, while desipramine inhibits the uptake of norepinephrine. Serotonin (5-hydroxytryptamine or 5-HT) is a monoamine neurotransmitter found in cardiovascular tissue, in endothelial cells, in blood cells, and in the central nervous system. The role of serotonin in neurological function is diverse, and there is little doubt that serotonin is an important CNS neurotransmitter. Although some of the serotonin is metabolized by monoamine oxidase, most of the serotonin released into the post-synaptic space is removed by the neuron through a re uptake mechanism inhibited by the tricyclic antidepressants and the newer, more selective antidepressant re uptake inhibitors such as fluoxetine and sertraline. In recent years, selective serotonin re uptake inhibitors have been introduced for the treatment of depression. Prozac is the most famous drug in this class. Clomiprimine, fluoxetine (Prozac), sertraline and paroxetine selectively block the re uptake of serotonin, thereby increasing the levels of serotonin in the central nervous system. Note the similarities and differences between the tricyclic antidepressants and the selective serotonin re uptake inhibitors. Clomipramine has been useful in the treatment of obsessive-compulsive disorders. Monoamine oxidase (MAO) causes the oxidative deamination of norephinephrine, serotonin, and other amines. This oxidation is the method of reducing the concentration of the neurotransmitter after it has sent the signal at the receptor site. A drug which inhibits this enzyme has the effect of increasing the concentration of the norepinephrine which in turn causes a stimulation effect. Most MAO inhibitors are hydrazine derivatives. Hydrazine is highly reactive and may form a strong covalent bond with MAO with consequent inhibition for up to 5 days. Hallucinogenic agents, also called psychomimetic agents, are capable of producing hallucinations, sensory illusions and bizarre thoughts. The primary effect of these compounds is to consistently alter thought and sensory perceptions. Some of these drugs are used in medicine to produce model psychoses as aids in psychotherapy. Another purpose is to investigate the relationship of mind, brain, and biochemistry with the purpose of elucidating mental diseases such as schizophrenia. A large body of evidence links the action of hallucinogenic agents to effects at serotonin receptor sites in the central nervous system. Whether the receptor site is stimulated or blocked is not exactly known. The serotonin receptor site may consist of three polar or ionic areas to complement the structure of serotonin as shown in the graphic on the left. The drugs shown in the graphic can be isolated from natural sources: lysergic acid amide from morning glory seeds, psilocybin from the "magic mushroom", Psilocybe mexicana. The hallucinogenic molecules fit into the same receptors as the neuro-transmitter, and over-stimulate them, leading to false signals being created. Mescaline is isolated from a peyote cactus. The natives of Central America first made use of these drugs in religious ceremonies, believing the vivid, colorful hallucinations had religious significance. The Aztecs even had professional mystics and prophets who achieved their inspiration by eating the mescaline-containing peyote cactus (Lophophora williamsii). Indeed, the cactus was so important to the Aztecs that they named it teo-nancacyl, or "God's Flesh". This plant was said to have been distributed to the guests at the coronation of Montezuma to make the ceremony seem even more spectacular. LSD is one of the most powerful hallucinogenic drugs known. LSD stimulates centers of the sympathetic nervous system in the midbrain, which leads to pupillary dilation, increase in body temperature, and rise in the blood-sugar level. LSD also has a serotonin-blocking effect. The hallucinogenic effects of lysergic acid diethylamide (LSD) are also the result of the complex interactions of the drug with both the serotoninergic and dopaminergic systems. During the first hour after ingestion, the user may experience visual changes with extreme changes in mood. The user may also suffer impaired depth and time perception, with distorted perception of the size and shape of objects, movements, color, sound, touch and the user's own body image. The barbiturates once enjoyed a long period of extensive use as sedative-hypnotic drugs; however, except for a few specialized uses, they have been largely replaced by the much safer benzodiazepines. Barbiturates are CNS depressants and are similar, in many ways, to the depressant effects of alcohol. To date, there are about 2,500 derivatives of barbituric acid of which only 15 are used medically. The first barbiturate was synthesized from barbituric acid in 1864. The original use of barbiturates was to replace drugs such as opiates, bromides, and alcohol to induce sleep. The hyponotic and sedative effects produced by barbiturates are usually ascribed to their interference of nerve transmission to the cortex. Various theories for the action of barbiturates include: changes in ion movements across the cell membrane; interactions with cholinergic and non cholinergic receptor sites; impairment of biochemical reactions which provide energy; and depression of selected areas of the brain. 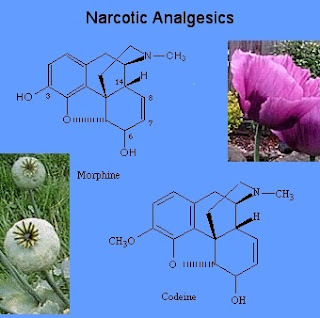 The structures of the barbiturates can be related to the duration of effective action. Although over 2000 derivatives of barbituric acid have been synthesized only about a dozen are currently used. All of the barbiturates are related to the structure of barbituric acid shown below. The duration of effect depends mainly on the alkyl groups attached to carbon # 5 which confer lipid solubility to the drug. The duration of effective action decreases as the total number of carbons at C # 5 increases. To be more specific, a long effect is achieved by a short chain and/or phenyl group. A short duration effect occurs when there are the most carbons and branches in the alkyl chains. Unlike other drugs which act in the region of the synapse, local anesthetics are agents that reversibly block the generation and conduction of nerve impulses along a nerve fiber. They depress impulses from sensory nerves of the skin, surfaces of mucosa, and muscles to the central nervous system. These agents are widely used in surgery, dentistry, and ophthalmology to block transmission of impulses in peripheral nerve endings. Most local anesthetics can be represented by the following general formula. In both the official chemical name and the proprietary name, a local anesthetic drug can be recognized by the "-caine" ending. the ester linkage can also be an amide linkage. The most recent research indicates that the local anesthetic binds to a phospholipid in the nerve membrane and inhibits the ability of the phospholipid to bind Ca+2 ions. Practically all of the free-base forms of the drugs are liquids. For this reason most of these drugs are used as salts (chloride, sulfate, etc.) which are water soluble, odorless, and crystalline solids. As esters these drugs are easily hydrolyzed with consequent loss of activity. The amide form of the drug is more stable and resistant to hydrolysis.